From pristine island vistas to the awe-inspiring stories of perseverance, the IRONMAN World Championship in Kailua-Kona, Hawaii, is the quintessential race all triathletes revere. While October signifies the triathlon season winding down for most of the world, the sport’s top professional and age-group triathletes are gearing up for the ultimate showdown on arguably the toughest course on the IRONMAN circuit. The 2018 edition marks the 40th anniversary of this iconic race. From hungry rookies looking to leave their mark on a world stage to multiple-time champions looking to reclaim the top step of the podium, expect all the usual fireworks and drama to unfold this October on the Big Island. The action-packed day of racing kicks off at 6:35 a.m. on Saturday, Oct. 13 with the male professional/elite athletes, followed by the female professional/elite athletes at 6:40 a.m. The male age-group athletes start at 7:05 a.m. and are followed by the female age group athletes at 7:20 a.m.
Don’t miss any of the important storylines–from who to watch to how to watch to what to look for at the 2018 IRONMAN World Championship. 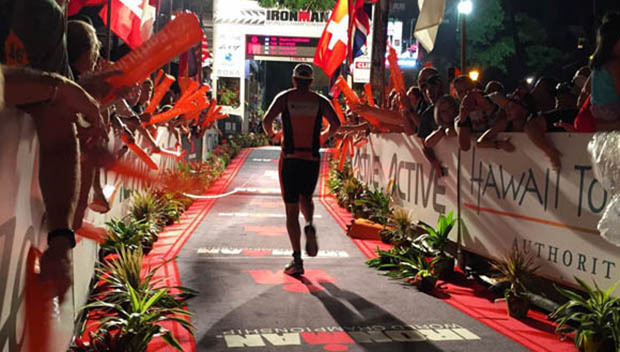 The IRONMAN World Championship course is deceptively hard. Course conditions vary from year to year, with strong trade winds and high temperatures always a threat on race day. The swim takes place in Kailua Bay, and athletes will be able to see tropical fish, reefs and sea turtles as they battle their way through the currents of the crystal clear water. The bike course follows the Queen Ka’ahumanu (Queen K) highway to the famous turnaround in Hawi, where strong winds will challenge even the toughest competitors on their return journey to T2. This year’s race includes more miles in the Natural Energy Lab than previous editions, so runners will be up against the notorious island heat through the turnaround back down the Queen K to the finisher’s chute. Can’t make it to the Big Island? Fear not! There are several ways to catch all the action at the IRONMAN World Championship from the comfort of your bike trainer at home. The IRONMAN World Championship Daily Show featuring athlete guests and industry personalities will be streamed Tuesday through Friday the week before race day at 2:00 pm ET on Facebook Watch. The 2018 IRONMAN World Championship will be streamed live with commentary through both NBC Sports (12:30 p.m. to 2 p.m. ET) and IRONMAN.com (12:10 p.m. ET) on Oct. 13, 2018. You can also watch the live feed on Facebook Watch here. You can also follow your favorite elite and amateur athletes with the athlete tracker tool on IRONMAN.com and with the IRONMAN Tracker app on the App Store and Google Play. This year’s women’s field will be one to remember. With three-time winner on the Big Island (and reigning IRONMAN World Champion) Daniela Ryf coming off a dominant IRONMAN 70.3 World Championship victory last month, she’ll be the overwhelming favorite in Kona this year. Ryf will be competing against another three-time IRONMAN World Champion in Mirinda Carfrae, who will be making her first Kona start since becoming a mother. Carfrae is fresh off a win at IRONMAN 70.3 Augusta, so we know her legs are up for the challenge. Keep your eyes on American favorite Heather Jackson, who placed third in Kona in 2016 and fourth in 2017. Great Britain’s Lucy Charles is another woman to watch—she placed second to Ryf both in Kona last year a month ago at the IRONMAN 70.3 World Championship. Note that podium contender Melissa Hauschildt (AUS) has withdrawn from this year’s race after setting a new record at IRONMAN Texas with a time of 8:31:05. She will undergo surgery on her right leg for endofibrosis. With the top three finishers from 2017 returning to the 2018 IRONMAN World Championship, expect some blisteringly fast times. Lionel Sanders (CAN) and David McNamee (GBR) will look to take the title from Patrick Lange (GER)–if successful, this will be the first time a German hasn’t stood atop the podium since Frederik Van Lierde (BEL) won in 2013. Van Lierde, Lange and Sebastian Kienle (GER) will all be competing as former IRONMAN World Champions, with two-time world champion and race favorite Jan Frodeno (GER) notably absent. Frodeno won the 2018 IRONMAN 70.3 World Championship last month but has since been sidelined with a fractured hip. Five-time ITU World Champion and 2014 IRONMAN 70.3 World Champion Javier Gomez will be toeing the line in Kona for the first time in his career. Finishing second at this year’s IRONMAN 70.3 World Championship, expect Gomez to arrive on the Big Island ready to compete.